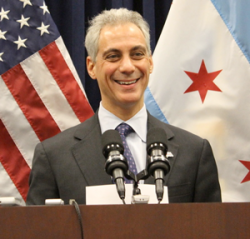 Mayor Rahm Emanuel attended a ribbon cutting ceremony for a new Cisco STEM Lab at Michele Clark, one of the City’s five Early College Science Technology Engineering and Mathematics (STEM) Schools. At the beginning of the second year of Michelle Clark’s STEM School, the corporate partner Cisco added a new STEM Lab and a Cisco Network Academy, which teaches students the skills needed to build, design, and maintain, networks—improving their career prospects while filling the global demand for networking professionals. For more information about the Early College STEM schools, go to cps.edu/ecss.